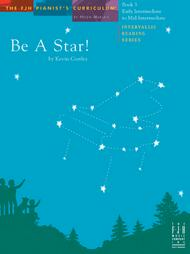 Be A Star!, Book 3 composed by Kevin Costley. Edited by Helen Marlais. For piano. Instruction. Intervallic Reading Series. Early Intermediate to Mid-Intermediate. Book. Published by The FJH Music Company Inc (FJ.FF1678).ISBN 1-56939-619-1.In Book 3, the early intermediate to mid-intermediate piano student will further their understanding of compositional forms, chords, phrases, intervals, and patterns within a piece of music. As each piece is studied by following its guidelines, the studen.